I’ve participated in several events since launching my personal chef business and sometimes I don’t realize how many people I’ve met and gotten to know. That is, until I’m out in the world and bumping into all kinds of people who may not even know my name, but they know what I do or maybe the name of my company. One of those people is a fellow personal chef, Debra Walter. I think I first met her at VegFest in 2011 and have run into her several times since. On a recent Saturday, my squeeze and I waltzed into Rust Belt Market in Ferndale, which is essentially a permanent craft fair right here in our town. Right by the door was none other than Debra, selling her “Max’s Granola.” We chatted for a bit and I bought a bag of granola, which is made right here in southeast Michigan in small batches. Five minutes later when she saw me devouring it as I walked around the market, she informed me her friends call it “granola crack.” That it is. 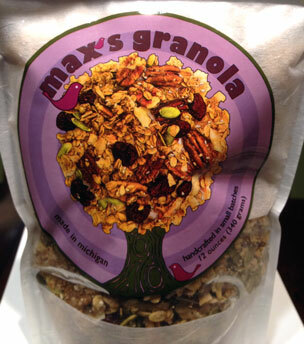 The granola is named in honor of her son Max, who was born with a brain disorder. She said a portion of the proceeds go toward research or a charity related to the disorder. I wish I could possible convey in words how delicious this granola is! Literally the best I have ever tasted. As a person who doesn’t keep too many sweets around the house, it has proven to be my go-to at night when I just want a little something. The best part is — it’s packed with good nutritious things, including organic oats, dried fruit, nuts, pepitas and other delicious. If you see it, you should pick some up. you won’t be sorry. My talented and hilarious former coworker Mary E. Twomey has released the first of her fantasy fiction books in a series that features only vegetarian characters — pretty awesome, huh? Even more awesome? You can get it on your kindle for free until June 5. (Click HERE). Mary and I were 2 cubicles away from each other at my first job after I made the move to Michigan. We had two totally different jobs and I was always in and out and running around as a reporter, so we didn’t chat much… until I ran into her at VegFest that spring and learned I had a new vegetarian friend! Then we started going in on cases of Dr. MacDougall’s instant soups and the rest is history. Mary E. Twomey – Author of the Saga of the Spheres. I was reading the book of Genesis in the Bible and I was amazed that the whole world and everything in it was created in just a few pages. I wondered how messed up a universe would be that I would create. So God’s was perfect in one chapter and fully functional. Mine turned into four books and is purely fictional. Harumph. The Saga of the Spheres quadrilogy follows the Sun, the Moon and the keepers of the elements as they battle each other for the greatest amount of light. Behind the scenes of our spinning earth are keepers of the elements who make sure that tornadoes don’t destroy cities, fires don’t ravage forests, earthquakes don’t decimate towns, and floods don’t take out humanity. They wrestle with the natural elements to ensure that the world keeps spinning smoothly on its axis. Since the beginning of time, the Sun has been fading, and the light that shines on the earth is dimming, causing the elements to be more volatile and impossible for the keepers to control. Now they must enlist the help of one man, Finn, to help them bring the light back to the Sun. The keepers war, the North Star steals light from the Sun, and the Moon is in disrepute. The end of existence is coming, and all the while the king, the Moon, Lir, remains silent. Can you tell readers a little bit about the world building in the book/series? How does this world differ from our normal world? This is a modern-day mythology. The earth as we know it is relatively the same, as it appears to humans. However, the Sun, the Moon and the Stars are both spheres and beings. They have desires, dark pasts, and a duty to maintain the Order so that the earth can continue spinning with little disruption. With the book being part of a series, are there any character or story arcs that readers jumping in somewhere other than the first book need to be aware of? Can these books be read as standalones? While jumping into a series part-way through may work for other books, it definitely will not for Saga of the Spheres. One sentence in book one could change how a new character is viewed two books later. It is a complex web of story lines that demands to be read from beginning to end. Writer’s block only plagues me occasionally. I make it a policy to always have at least two completely different writing projects going on at the same time. If I get stuck on one, I switch to the other. By the time I’m ready to go back, the issue has most likely worked itself out. The trick is to make the two projects nothing like each other. If I’m writing a mythology, the other must be a comedy, and in a different format. Right now I’m working on a social/political commentary that is a young adult fiction novel. I contrast that by working on a comedy screenplay when I need a breather. When I’m working on a project, I write five days a week. Taking the weekends off to rest and let ideas simmer helps tremendously. I also think in story plots while I’m dreaming. If I’m lucky, my dreams will start where my writer’s block left off, and then tell me how it’s supposed to unfold by the time I wake up in the morning. True multi-tasking. Do you have any weird writing quirks or rituals? Quiet house. Loose outline written in a notebook using a fine-tipped blue Bic pen. Glasses off, contacts out (helps to keep the outside world at a distance. I focus much better when all I can see is what’s directly in front of me). Phone off. I wrote my first story, a mystery, before I had gone to school and learned to form letters. I still have it. It’s a page of scribbles, but I know what it says! I was three, and loved listening to my parents read to me. Though I occasionally delved into other professions, it was always understood from a very young age that I would do whatever that job I felt like (ballerina, archeologist, teacher) on top of being a writer. Writing wasn’t really a profession to me, it was just… me. While studying in class, others would take notes. I would appear the studious girl with my notebook out, but I was always working on a novel. It wasn’t a conscious choice. Professionally I considered myself a writer when I was paid to write advertisement stories for the newspaper I worked for. Other than writing, what are some of your interests, hobbies or passions in life? I am a vegetarian and truly enjoy trying out new recipes. When I got married, I was not a good cook. I made it a goal to visit the library regularly and check out new cookbooks that had different dishes from the few I could make. Eight years later, I still make it a priority to cook a new dish every week or so at least. I love challenging myself in ways that yield such immediate gratification. In my spare time, my mom and I founded and run a children’s charity, Jesus Loves the Little Children, Inc. We bake cakes and cupcakes for underprivileged kids and teens, and have a fun time sharing smiles and being goofy girls in the kitchen, covered in frosting, making a glorious mess. I love going for walks, watching the animals at the zoo, going to church, and reading. I have a childish joy for throwing asinine dinner parties. We had one party celebrating Brussels sprouts. There were seven different dishes featuring everyone’s favorite vegetable. My husband and I host a birthday party for Harry Potter every year on July 31. Suffice to say, it’s the weirdest thing our adventurous friends do all summer. Luckily, we have an eclectic collection of very tolerant friends. Oh, if I told you that, it wouldn’t be a surprise! The social/political commentary will be either a trilogy or a quadrilogy. I’m about halfway through the series now. If I can get my act together, the series will be done next year. More realistically, 2014. If a producer magically calls me up and just begs to know if I have anything for the big screen, then you’ll be seeing a goofy romantic comedy I wrote a few months ago. It started out as a way to give myself a break from the seriousness of the social/political commentary, but turned into the most fun I’ve ever had writing a screenplay. So really, I’m putting this on you, readers. If you want to read my screenplay, send a producer with a medium Hollywood budget my way. www.SagaoftheSpheres.com, you can like my Saga of the Spheres Facebook page, or find me on Twitter (http://www.twitter.com/shesleepssoftly).